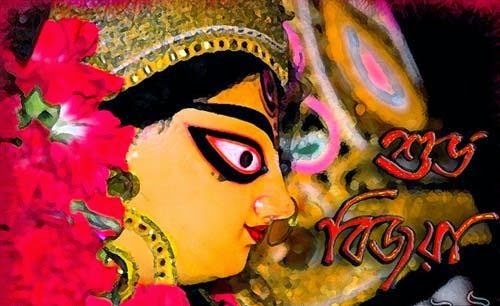 Durga Puja is over now and we have to wait for another year for this glorious year. On this day, Mother starts her journey back to her Husband's place from her mother's place. Everybody bid Farewell to Mother with tearful eyes and heavy heart and eagerly wait for her to come again next year. In a grand procession with lots of dhaks, drums and trumpets, the idols of Durga and her children are brought to a riverside to immerse it in the water. This immersion ceremony is known as Visanjan. Before Ma leaves, every married woman of all age group go to nearby pandal and apply sindoor to the goddess and each other. This ritual is known as "Sindoor Khela". Men follow the customary 'Kolakuli' (embrace each other). The younger members do pranam (touching the feet) to the elders. Bijoya is not restricted to one day alone. You get time till Kali Puja to wish your fellow bongs "Shubho Bijoya". Bijaya dashami is incomplete without mentioning the delicacies like various sweets and crispy treats. 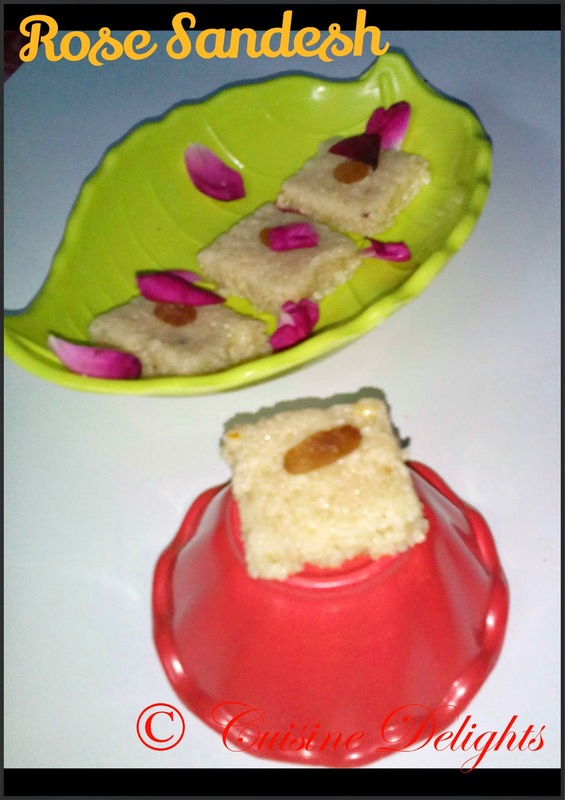 Thought to make some bengali sweet at home. 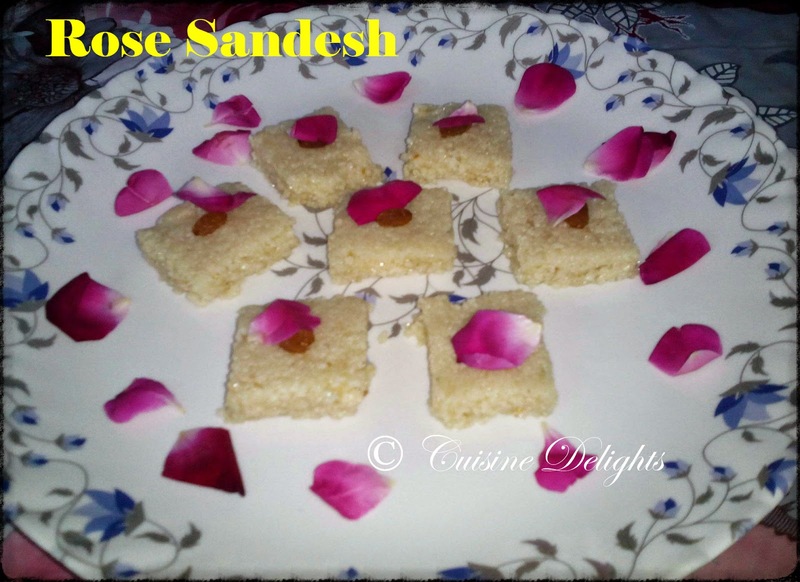 So, I made Rose Sandesh for Bijoya Dashami for my family and friends and with this I want to wish everyone a Very Happy Bijaya Dashami..
Heat the milk in a vessel. When it starts boiling add citric acid. Stir continuously using a wooden spoon till it curdles completely. Remove from flame. Drain the curdled milk through a fine muslin cloth and wring it to squeeze out excess water from the resultant paneer. Open the cloth and mash the paneer with your palm on the cloth itself. If the paneer is hot use the edge of the cloth to rub it. Knead or grind the chhana or paneer into a fine paste. 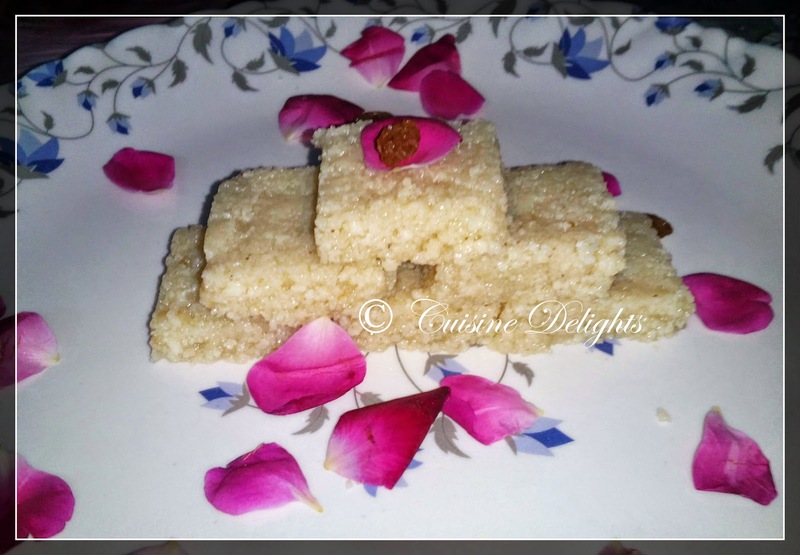 Heat ghee in a pan, fry together the chhana, sugar, cashew powder and elaichi powder, stirring all the time. Remove from the heat and add rose water and mix well. Grease a plate with ghee and pour the cooked paneer mixture on the plate and spread evenly. 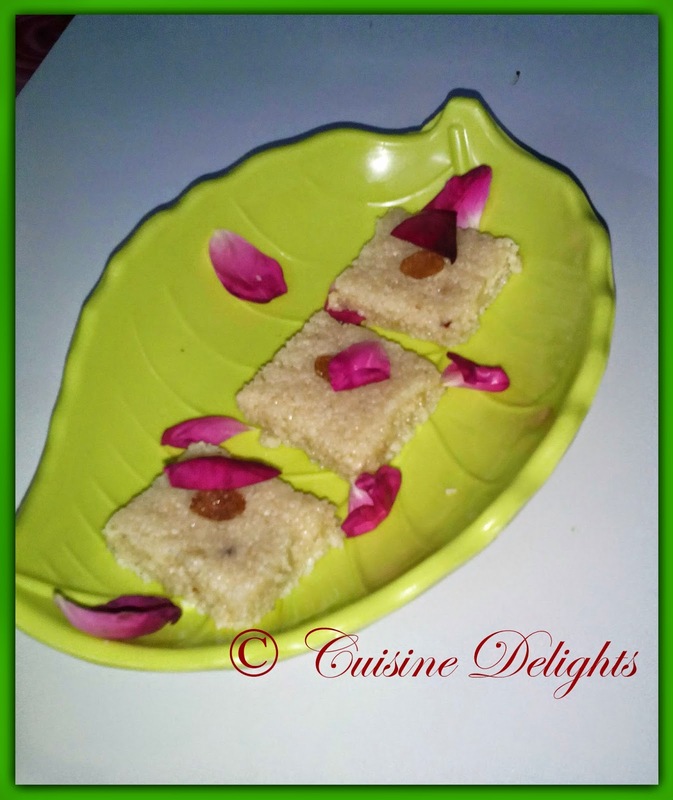 Decorate with raisins and rose petals.